Martial arts is more than just physical training and fitness. It must encompass the complete mind-body-spirit, while also providing us with the clarity to be emotionally aware of our actions as well. A good way to reflect on this is through meditation. Meditation is not sitting on a mountain top and chanting (although, feel free to do that if it makes you feel better). Meditation is simply “concentrated focus’, whether it is on breathing, movement or attention to something. We are all so busy that sometimes we forget to focus on the things that are really important to us. Take time each day to take some deep breaths, or close your eyes and really listen to the sounds, or do some slow pre-meditated movements (such as your Multiple Defence). 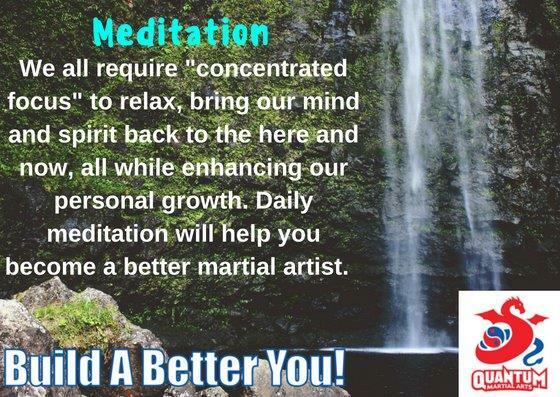 This will help you to increase awareness of the present moment, reduce stress, help you relax, and enhance your personal and spiritual growth. And isn’t that what martial arts is all about, i.e. enhancing your personal growth?